Today I wanted to give my little review of this new DVD series that was so generously given to me for Christmas from my family. This is Cesar Santos' Secrets of Portrait Painting. So let me start off with an overview, and then get into the highs and the lows. 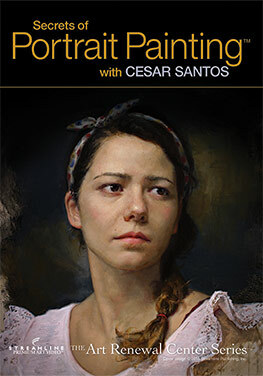 This is a 4-disc series that features Cesar Santos giving a full demonstration of his impressive realist portrait painting technique with his wife Valentina serving as his very patient and excellent sitter. Literally every stroke of his brush is shown (99.999% of them at least). He begins with a basic drawing using a raw umber PanPastel, and then follows with a 3-stage painting process of dead coloring, first painting, and second painting. And he explains what each of those terms mean as he gets into them. From the first mark of the pastel to the signing of his finished piece totals about 18 hours. And with that are a few extras, including a nearly hour-long interview with Santos. Altogether, the content on this DVD set totals nearly 20 hours. So you'll almost certainly need a few days to watch it all the way through. I took about 3 days myself. So let me start of with the low points, because there are so few. But let me word this in terms of who should not get this DVD. Obviously, anyone with a serious aversion to long demonstrations would probably not like it. As I said, the demo itself consists of about 18 out of the 19-20ish hours of this DVD series. It is a slow and tedious process. Santos does not paint alla prima. This is the traditional, academic indirect approach to portrait painting. If you're looking for a quick-paced alla prima DVD, I would highly recommend Robert Liberace's "The Alla Prima Portrait". That demo is around 3 hours. Honestly, however, I think making a big deal about the length of this demo is a bit nitpicky because each stage of painting that Santos goes through is critical to the process and has its essential elements and principles that need to be understood in order to have a successful painting. One low point that should be pointed out is that the promo for this DVD indicates that this is a great instructional tool for any artist, including beginners. To that, I would say yes and no. On the one hand, I do believe there are points to this demo that beginners will find very beneficial. On the other hand, I also believe the demo leans towards the advanced painter. For instance, Santos will occasionally use terminology throughout his demo that may be unfamiliar to the average novice painter, and then not define those terms or concepts. So it presupposes that you as the viewer already know what some of these terms and concepts mean. So would I recommend this DVD to a beginner - Yes and No. It mostly depends on what type of beginner you are. If painting is something you do part-time on the side, and you don't have any intention of investing 100% of your effort into it, then probably not. I could see this DVD being overwhelming for those beginners. But if you are a beginner who has decided to make the pursuit to excellence in painting a full-time effort, then absolutely I would recommend this DVD to you. That leads us to the next low point... at least for some - those with a very tight budget. Yes, it's a $200 DVD set. I was fortunate as I said, because my family is generous. But if this is something you are looking to purchase yourself, then I can certainly understand the price tag being an issue for some. Especially for those of us artists who simply don't have those funds. But when you think about it, $200 for a DVD that you can watch over and over again with a master like Cesar Santos versus $400-500 for a workshop that only lasts a few days, and you only get what you take with you. Now it doesn't sound so bad. Of course, the disadvantage of the DVD over a workshop is that you can't ask Santos any questions about what he's doing. And you not there in person to see the demo, so you're at the mercy of your TV screen quality. On that note, I might also point out that the camera angle on the sitter Valentina was different from the angle that Cesar was seeing and painting her. So to make an exact comparison between the sitter and Cesar's painting is difficult for the viewer to make. All in all, those where the only low points I can really make. And they really aren't that low, to be honest. The high points certainly outweigh the low. First of all is the quality of instruction from Santos. With the exception of some of his terms as I mentioned, he is an excellent teacher and explains his reasoning and methodology behind his process very well. He not only explains what is important in his process, but why it is important. You finish the DVD with enough confidence that you can take what he taught and do it yourself, or at least apply many of the principles in your own approach to painting. Second, many instructional DVDs cover alla prima painting techniques. There is no shortage of those. But this is an excellent DVD for those of us still interested in the traditional, indirect approach of working a painting up in layers. Above all, it teaches you the art of slowing down and treating your painting with reverence and care. It teaches you to not take even the little mistakes for granted. If you see a mistake, go back and re-work it until it is correct. Don't settle for "That's good enough." This is a DVD about the discipline of painting. What I really loved most of all about this DVD is how genuine and honest Cesar Santos was throughout his demonstration, both with himself and with the viewer. He never once pretended that he was flawless in his painting. He made mistakes during his demo! And he had the honesty to point out his mistakes, and then go back in and correct them. In addition, he described and explained to us a clean-cut approach and process. However, once again he was honest enough to show us that it's not always that simple or clean. The process is messy, and sometimes you will find yourself in the latter stages of the painting, and you'll have to go back to an earlier stage in order to make corrections or refinements. He absolutely did not settle for "good enough". If something needed refinement, he worked on it until it was simply "good." And he encouraged us to do the same in our own painting, and avoid taking the easy way out, lest we "cheat ourselves." I could go on and on, but these are some of the main points I got out of the DVD, and overall I would give it 4.9 out of 5 stars, and would highly recommend it to anyone wanting to invest in the pursuit of excellent, high realist portrait painting techniques. God bless, Happy New Year, and happy painting! Thanks so much for this, it's really helpful. I am torn about buying this DVD (or the download)....will have to think about it more, but this is very illuminating. Yes, it really is worth it. You made an excellent choice Michael. And like I said, the great thing is you can watch it and re-watch it however you want without the pressure of necessarily having to take everything in at once. It's great! Best of luck, and happy painting to you! Hello Jay, sorry for the delay in response, I just caught your comment here. To answer, yes he does get into the color quite a bit. And shows exactly what colors, name and brand, that he uses in the painting. Libraries wouldn't tend to buy this video for two reasons: 1) Expense. Libraries have budgets, too. 2) The vast majority of their artist patrons would be alla prima painters -- the library can buy several alla prima videos for $200. The major problem with the whole idea of this video is getting someone to sit for you for hours. Unless you're going to paint from a photo it's a difficult proposition. Ya lo había dicho antes, su técnica es maravillosa pero es extremadamente caro us$ 200 es la mitad de un sueldo en Chile, que pena que sea así tan poco democrático. After spending four days watching this video i have to agree, its one of the best ive ever seen, after years and having seen many art demo dvds and tapes.I would like to add that Santos himself is the high point as by the time i got to the fourth dvd i absolutely had the feeling i was sitting next to him and he was talking to me.His teaching and info he threw in after all his work towards art is worth the money many times over.Excellent. -2010 Gallery, Prairie Village, Kansas.